Several variables affect how your slide show runs. For example, you can set up a slide show to be presented by a live speaker or to be browsed by a viewer. 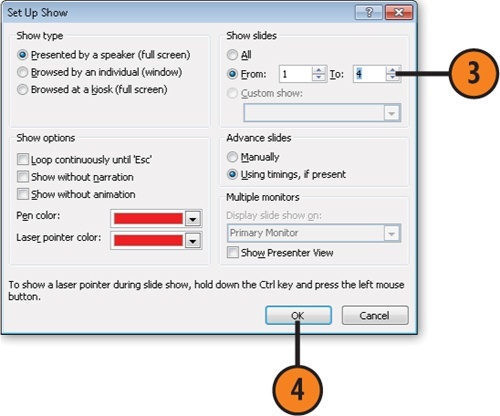 You can specify that a show loop continuously or be shown with or without a recorded narration. 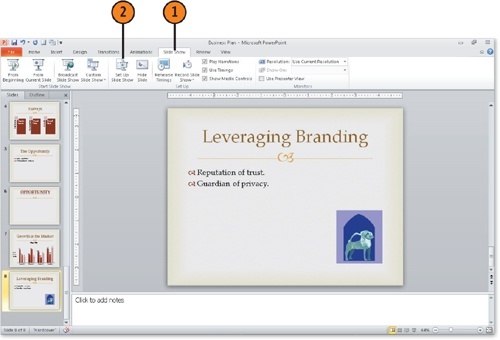 You can even choose to have only a subset of the slides in the presentation included in a particular slide show. You can set up your show to advance manually when a presenter clicks or automatically according to recorded timings. Finally, you can specify to use more than one monitor. With this feature, the presenter can use one monitor to orchestrate the show while the audience views the presentation on another monitor. Click Set Up Slide Show. Presented By A Speaker displays the slide show in full-screen mode and assumes a live presenter is running the show. Browsed By An Individual is the setting to use if an individual will view the show from a computer or CD. 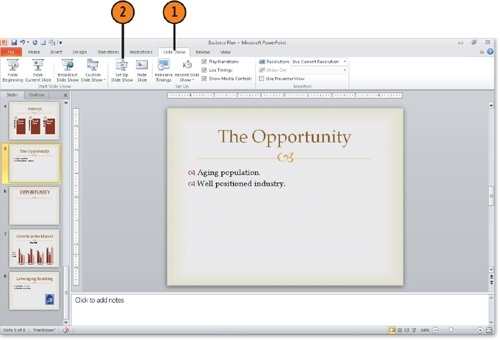 This option runs the presentation in a window rather than full screen. Browsed At A Kiosk provides a self-running, full-screen presentation that might be set up at a kiosk. If you want a show to run unattended, it’s a good idea to loop it so that it repeats over and over again in your absence. Loop Continuously Until ‘Esc’. Choose this option if you are running the show unattended and want it to continuously repeat. Show Without Narration. If you recorded a narration but now want a live presenter to give the show, select this option. Show Without Animation. Because animations might not run smoothly on slower computers, you can turn them off by using this setting. Click the arrow on the Pen Color list and choose an ink color from the drop-down palette for annotations you can make while running a show. You can choose additional colors for the pen by clicking More Colors at the bottom of the drop-down palette. This displays the Colors dialog box, where you can select a standard or custom color to apply. You can also use your mouse as a laser pointer during a slide show by holding down Ctrl and pressing the left mouse button. 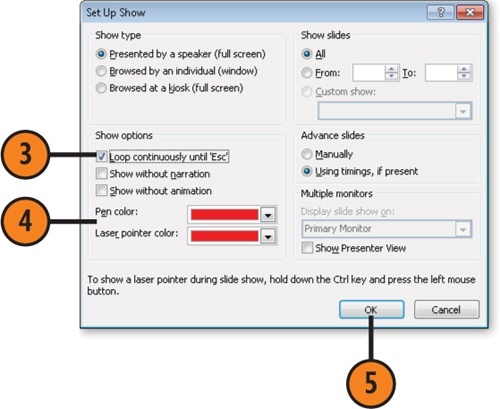 Set the laser pointer color using the Laser Pointer Color drop-down palette in the Set Up Show dialog box. 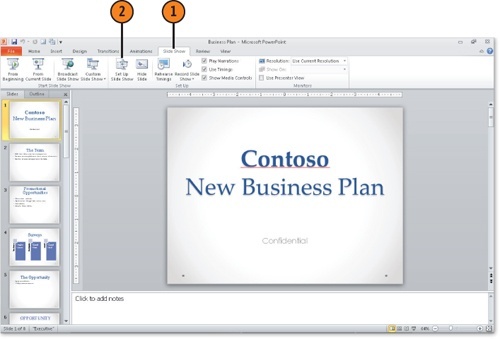 Choose All to include all slides in the presentation (except for slides you’ve hidden). 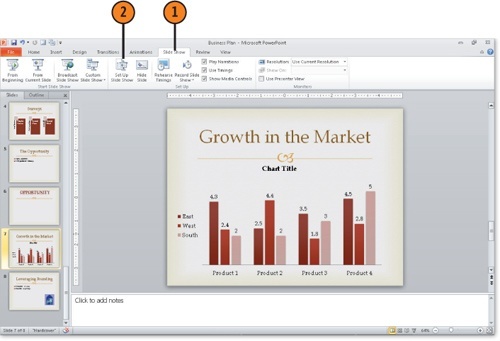 Enter beginning and ending slide numbers in the From and To boxes to show a range of slides. Click Custom Show to pick and choose any number or range of slides you want to present. This feature enables you to present different versions of your show to different audiences. If you have a large slide show and find it’s running slowly on the presenting computer, don’t shorten your show. Instead, you can modify your monitor’s resolution in Windows Control Panel by using the Adjust Screen Resolution link.  Your slides run faster at a lower resolution, such as 600×800, although the image quality is grainier. Manually requires you to click a mouse, press an arrow key, or use the navigation tools in Slide Show view. Using Timings, If Present moves the slides forward automatically based on the timings you save when you rehearse the show and save timings. 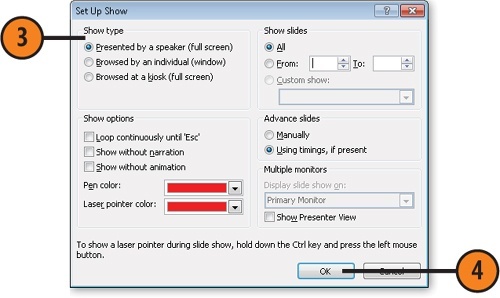 The Show Presenter View option in the Set Up Show dialog box can come in handy if you have a system with multiple monitors. 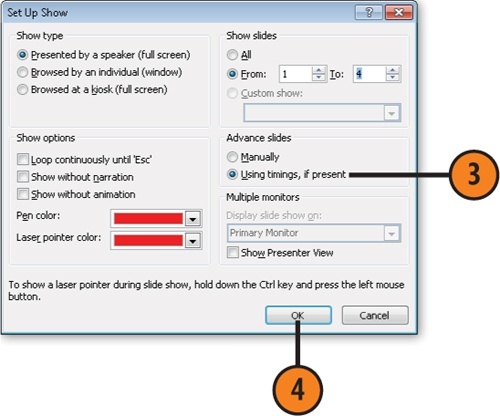 Select it if you want to control the show from one screen—your laptop, for instance—but use another screen to display the presentation to your viewers. By using the Show Presenter View option on your screen, you can navigate the slide show, and your actions are invisible to your viewers. For example, you can use thumbnails of your slides to build a custom presentation, reordering slides to offer a recap of key ideas on the fly. When you record a narration, you are offered the option of saving timings as well. If you do, those timings can be used to advance slides based on when the narration for each slide is complete. The Slide Show tab includes a Use Timings check box that you can select to override narration timings.